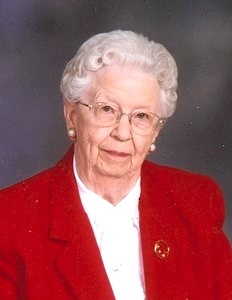 Opal Irene Brown, 99, of Olathe, passed away on April 12, 2017 at Good Samaritan Nursing Center. She was born on October 12, 1917 to Ernest and Bertha (Stuteville) Slusher in Stilwell, KS. On June 2, 1943, she married Ritchie R. Brown. Opal and Ritchie resided in Johnson County, Jefferson County, Coffey County, eventually settling back in Olathe, Kansas in 1986. She was a member of the First Christian Church of Olathe, and the Morning Grange. Opal was an active member of First Christian Church, including serving many dinners for the church members as well as the community. She also enjoyed baking pies for friends and family alike. Opal is survived by her sons, James R. (Shirley) Brown,and John Brown, and grandchildren, Scott Spruytte, Phillip Spruytte, Christie Childers, Jamie Brown, Mindy Clarke, Kelly Barney, Cortney Pierson, Christopher Brown, and Karah Brown, and 14 great-grandchildren. She was preceded in death by her parents, her husband Ritchie R, Brown, daughter Nancy Spruytte, sister Eulah J. Schrader, brothers Samuel T. Slusher, John W. Slusher, Raymond Slusher and Harry R. Slusher. Funeral services will be held on Tuesday, April 18, 2017 at 2:00pm at Penwell-Gabel Funeral Home, Olathe, KS, with visitation at 1:00pm. Burial in the Olathe Memorial Cemetery. Memorials are suggested to Good Samaritan Nursing Center, Olathe, KS.